I got a phone call from a client who wanted her television checked by a technician. I passed by her place and I was shown the TV which needed checking. 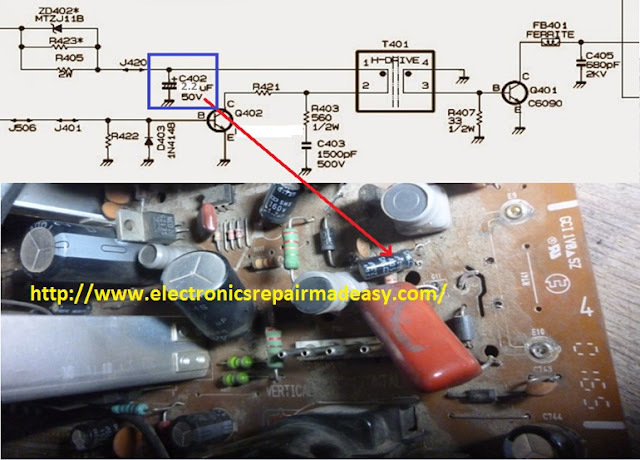 I pressed the power button and no sign of life was noted on the television, therefore I opened the set and with the Television back cover removed, I applied the power once again and this time I could hear some noise (chi…chi… chi) near the fly-back transformer. I powered the TV off and removed the power cable from the outlet and decided to do resistance and since there was no visible component broken or darkened area, I decided to test the H.OT transistor. I cut the middle leg of the H.O.T and tested again and still got a beep between the collector (middle) leg and emitter and therefore concluded that the HOT is actually shorted. Usually when the HOT is shorted it a can also load down the power supply such that It will not start just like when we have a short on the primary side. So after disconnecting the middle leg from the circuit, I applied the power again and this time the power led was now on, previously the television appeared dead and the power on led was also off. This is a classic example where we have the TV appearing dead due to a short on the secondary side, a technician who is not experienced can spend a whole day checking the primary side while the problem is on the secondary side. 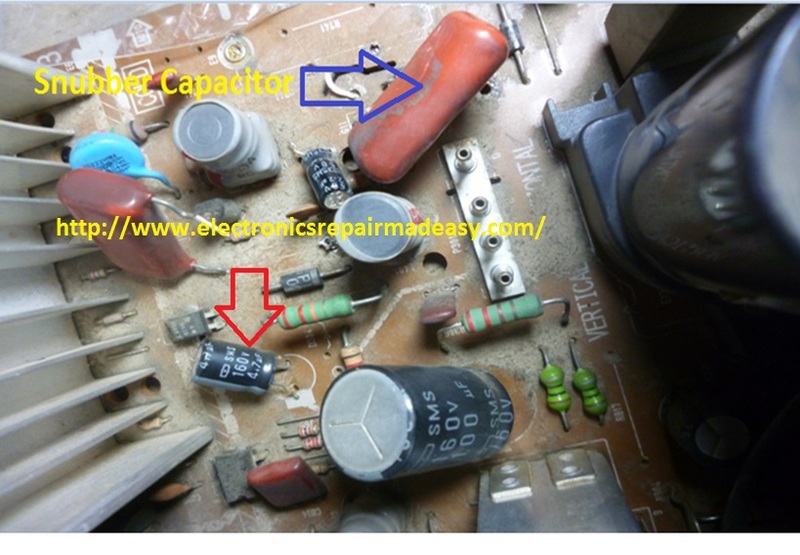 I also noted that the TV was not able to discharge the main capacitor and this also can point to a problem on the secondary side since TVs discharge the main capacitor via the secondary side that why you see the power on led takes a few seconds before going off completely. For those who have bought my ebookCRT television repair course you will recall me saying that HOT rarely fail without a cause and in this case I decided to check the health of the surrounding components. 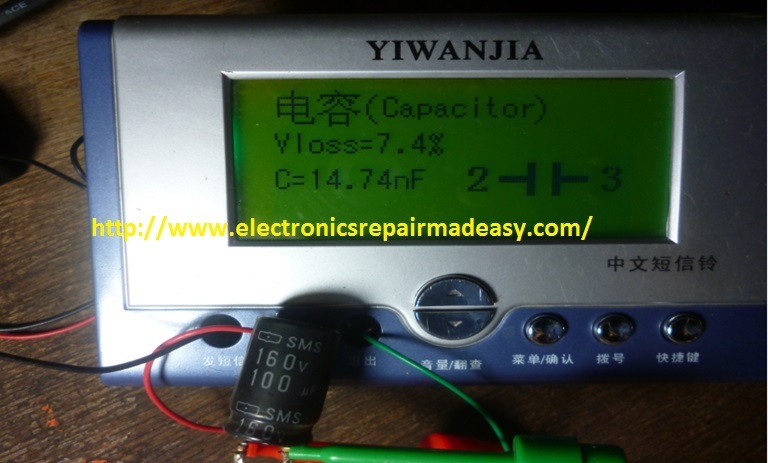 I started checking the snubber capacitor and I was happy with it. 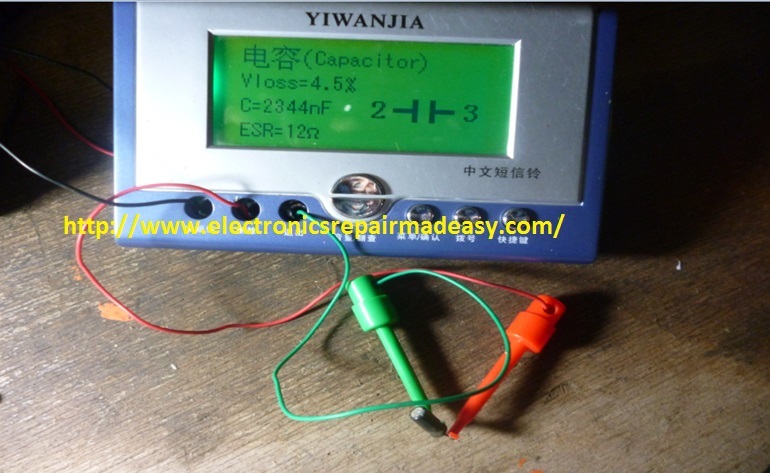 I continued checking capacitors and I was not happy with C402=4.7uF/160v which has ESR of 6 Ohms, as you can see this capacitor is rated 160Volts so it is the one which filter the supply to the horizontal drive transistor which drive the HOT transistor and therefore this supply need to be well filtered. I continued checking and bumped on another capacitor C308=2.2uF/50v with ESR reading of 12 ohms. I tested the main B+ filter capacitor and I was shocked with the results as you can see below, the capacitor which was rated 100uF and now reading 14.74 nF and ESR was beyond my meter maximum range that I why you can see no reading at all. Getting replacement spares for these three capacitor was easy and I replaced them immediately. I went to the shop to buy the HOT transistor which was also shorted part number 2SC5966 and to my surprise this part was not in stock. So I decided to figure out the replacement and to start with I googled LG TV 14 inch circuit diagram to check out which other part number they use for HOT in other LG models common in the market. I found an LG 14 inch TV using 2SD1877 for the HOT and after checking its datasheet and comparing with 2SC5966 I noted it has almost the same specification but 2SC5966 was better off and since I had no other alternative replaced it with D1877 and powering on the TV came up well and did a run test for 2 hours and still the new transistor substitution was holding strong and no overheating and with that ended my repair assignment successfully. Note:The multi-component tester used in this assignment is no longer in the market and the for now we have the new model Mk-328 multi-component tester which is doing very well and selling at my ebay store here. Thank you for your feedback, Yes you can publish the article but make sure you link back to my blog for those who would like to visit my blog for more materials. i wonder if testing the crt board with the series bulb , needs the degaussing coil to be dettached. Because i have tried in my samsung model crt, testing in series bulb ,light up so bright when the degausing coil is attached. but when dettached the light came to dim. How was it? Whats the right way to test in using a series bulb.